Herbies Hideaway A Unique Getaway Just 4 Miles From Rickett's Glen State Park. 4 bedrooms, living room, full bath and kitchen sleeps 8. Herbies Hideaway, located in Sweet Valley, PA is a beautiful four bedroom home with full kitchen, bath and living room with central heat and air conditioning. It is situated on 70 very private wooded acres overlooking the Huntington Creek. It is ideal for family vacations or fishermen and hunters. You will experience a peaceful and quite atmosphere, no noise, no crowds and no traffic. We are Pet Friendly. This is a Smoke Free Facility. Our kitchen includes refrigerator, stove, microwave, coffeepot, toaster, cooking utensils, dishes, silverware, salt/pepper, spices, coffee, sugar and powdered creamer. One bedroom is equipped with a queen bed the other three have double beds and all have a clock, closet or dresser. The only things you need to bring are your own linens, towels and food. Outside you will find a charcoal grill, fire pit, picnic table, swing set and deck. Ricketts Glen State Park is less than 5 miles away. COME AND ENJOY SUMMER IN NORTHEAST PA.
SPECIAl: Book a 5 or more night stay and receive FREE firewood ($25.00 value). Just 4 miles from Rickett's Glen State Park. No Neighbors just quiet country side located along the Huntington Creek. Nestled in the woods along the Huntington Creek. You will experience seeing all types of wildlife and enjoy the peace and quiet of country living. Located along the Huntington Creek. Some spices, sugar, powder milk. You can enjoy the great outdoors by playing some of the outdoor games or taking in the sights of nature or just stay inside and view Satellite TV with 200 channels available. There is also an outdoor swing set for the children. Despite the extreme heat and bugs, we enjoyed our stay at Herbie's Hideaway. The creek is beautiful and our kids had fun wading through it. 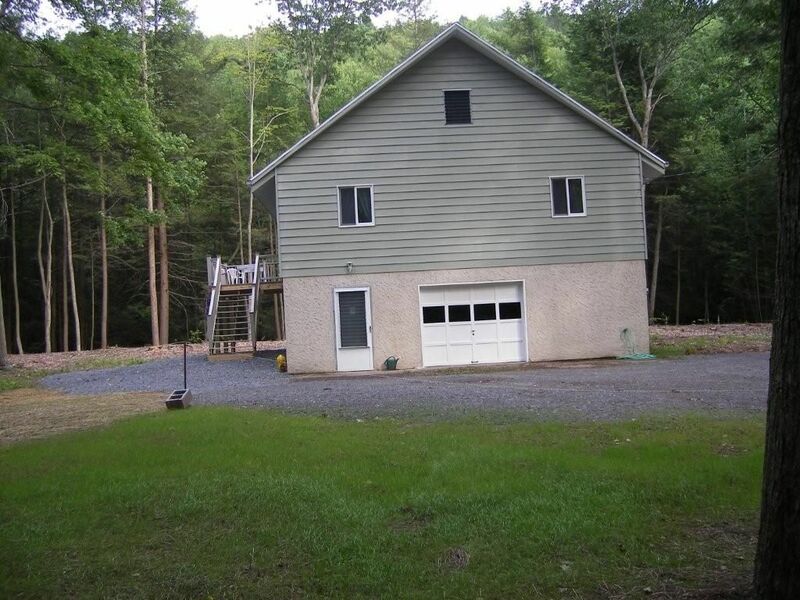 The property is very private and is close (10-15 min) to Ricketts Glen State Park. Ricketts Glen has great hiking trails along many waterfalls and also a nice beach area along Lake Jean where you can swim or rent boats. Our kids really enjoyed the state park. On our last day, we stopped at Knoebels which was on the way home for us. It's a great amusement park; very affordable and family-friendly compared to some of the bigger ones in PA. The house was spacious enough for our family of 5, and thankfully the AC worked well. Do make sure to do online research beforehand for activities in the area, because we had no internet/cell service (AT&T) the whole time we were there. Only reason we gave 4 stars instead of 5 is because we were surprised how much clean-up the hosts expect the guests to do. And certain things like limiting the amount of garbage bags you're allowed to use, bothered us a little. Had we known these things beforehand, I don't think we would have cared as much. All in all, we had a really nice time! Thanks for sharing Herbie's Hideaway with us. We are glad you enjoyed your stay at Herbies Hideaway. Sorry you felt that you had to do too much clean up but since we do not charge a cleaning fee we ask that you clean up after yourself nothing more. Glad to see you found our brochures helpful and had a fun visit to Knoebels. Thank you for choosing Herbies. something that everyone needs. A break from everyday hectic life is so refreshing. We look forward to having you return in the future. Thanks for choosing Herbies Hideaway. Enjoyed my stay there even though it was work related, it was very quiet with a creek viewable from the kitchen window or out on the deck. there were plenty of cooking amenities for indoor or outdoor needs. playground equipment for the kids, a fire pit,and covered picnic area .Would be a great get away for a family given the four bedrooms. state park is nearby for hiking walking etc. This place was quite the find for my family. It is very clean. We wish we had more time to enjoy the property and have a fire outside in the fire ring. We went to Rickett's Glen - it is only 10 minutes away. We also went to Knoebel's Amusement Park - it was about an hour away. We ate at the Trail's End Restaurant 10 minutes away and the breakfast was so filling even with hiking the falls we didn't have lunch until 4PM. The owners are very welcoming and thorough with explaining the rules and how to find everything. I would definitely book this home again for another trip with our family. Relaxing and Home Away From Home! My family adore this property! We've stayed for a weekend the last two summers in a row, and can't wait to get back again! It's got the best of both worlds-it's secluded within beautiful nature but it's also close to Rickett's Glen State Park and Lake Jean, quite a few restaurants, and many antique stores and quaint little shops. It's so quiet and peaceful, and the accessible creek is a treasure!The property is roomy, clean and well-maintained. The owners, Marie and Rich, are absolute sweethearts....they are available to you should you need anything but don't hover like a shadow. They are very gracious, and this place really feels as if it's your own private sanctuary vs. feeling like an ever-monitored guest. Many thanks, guys. Good Luck with all of your future rentals....and We'll See You Soon! My boyfriend and I rented out Herbie's Hideaway for the week of New Years 2008 with a few of our friends. We had an incredible time. We found the cabin to be very spacious, well-kept, and very clean upon our arrival. Marie and Rich made sure that our cabin stay was very comfortable and they were very accommodating. The group of us had a great time-- every afternoon we lit a campfire in one of the fire pits for roasting marshmallows and making s'mores. We cooked dinner outside every night on the grill or the campfire too. During the day we spent time hiking with our dogs in the surrounding woods. We also took a few trips to Glen Ricketts Park to hike on the trails or take in the beautiful view of the waterfall. My boyfriend and I (and our friends) would definitely recommend a stay at Herbie's Hideaway to anyone looking to get away from it all, enjoy nature, and roast a few marshmallows :) It was a great vacation. Marie and Rich are extremely thoughtful and sweet. We would absolutely stay at Herbie's Hideaway again. 10 Minutes or Less-Rickett's Glen State Park, Morgan Hills Golf Course, Churches, Grocery stores and State Game Lands. A Short Drive-Several Restaurants, Benton Rodeo, Penn State Obsevatory, Pikes Creek Park, Harvey's Lake, Moon Lake, Lake Jean, Francis Slocum Park, Harris Pond and several fishing creeks.45 to 90 minutes-Wyoming Valley Mall, Columbia Mall, Lycoming Mall, Knobles Amusement Park, Cabela's, Sno Mountain/Montage Mountain, Toyota Pavillon, Mohegan Sun Casino, Steamtown Historical Site, Claws 'N' Paws Wild Animal Park, Lackawanna Coal Mine Tour, Bloomsburg Fair, Wachovia Arena, Gander Mountain, and many other attractions. COME AND ENJOY, YOU WILL FALL I N LOVE WITH HERBIES IN THE COLORFUL MOUNTAINS OF NORTHEAST PA. Don't forget we are less than 5 miles from RICKETT'S GLEN STATE PARK. Rates vary depending upon length of stay and number of guests. 6 percent sales tax must be added to all rates, Pet fee is $10.00 per pet per night limit 2 pets.